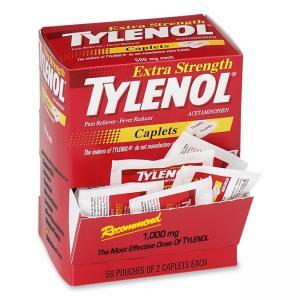 Each packet contains single dose of Tylenol Extra Strength medicine. Sanitary because no one touches it except the person taking it. Works fast on your headache. Won't damage your stomach the way aspirin or even ibuprofen can. Reduces fever. Temporarily relieves minor aches and pains from headache, muscular aches, backache, minor pain of arthritis, the common cold, toothache and premenstrual and menstrual cramps. Each single dose packet includes two caplets.